Top priority for Merry Marketplace is to offer the widest variety of top quality merchants for our shoppers. Our venue, Top Shelf Sports Arena, was chosen for its great location, ample parking, cleanliness, concessions, great lighting and clear sound system. The arena has been mapped into 10' deep booth spaces. Among these are a limit of corner spaces. All booths will be furnished with drapery, eight feet in height across the back of each booth, and three feet in height on each side. Merchants must provide their own tables and other furnishings. 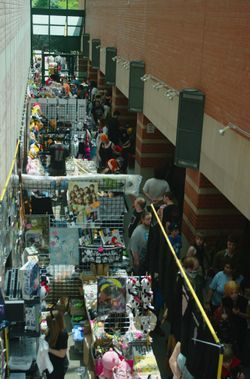 Each applicant for booth space is reviewed for quality, uniqueness and sales potential in the show. To apply, each applicant must submit a complete our Merchant Application below. Once approved for the show, each Merchant must submit booth fee and photos of the merchandise to be offered. Ready to become a Merchant? See the Merchant Application now! Can't do the show this year, but want a piece of the action? Consider decorating a tabletop tree to place in our Tabletop Tree Auction to benefit Faith House. It's a fantastic way to promote your goods to show attendees!